Sea Watch - Ocean Front mit Strand, unglaubliche Aussicht! Unser renoviertes 3-Bett / 2-Badehaus direkt am Meer hat den Charme von Old Cape Cod mit allen Vorzügen des Neuen, um den perfekten Ort für Ihre Cape Cod-Erinnerungen zu schaffen! Sie können Ihr Haustier mit unserer Genehmigung zu bringen. Sie sind Teil der Familie auch. Unglaubliche Aussicht aus dem Wohnzimmer, Esszimmer, Gästezimmer, Schlafzimmer und der Terrasse auf der zweiten Etage, die die Länge des Hauses verläuft. Queen-Betten in der Master-und Gäste, Doppelbett in der dritten, Whirlpool-Badewanne und separater Dusche im Master-Bad, Vollbad im ersten Stock, voll ausgestattete Küche. Outdoor-Dusche mit heißem und kaltem Wasser. Schwimmen und Sonne am Strand, sitzen und beobachten das Meer als die Kinder Mittagsschlaf, ein Buch zu lesen auf der Fensterbank im Schlafzimmer, kochen auf dem Gas-Grill und speisen 'zum besten Ozean Beistelltisch im Haus ". Im Herbst und Winter, kuscheln auf dem Sofa vor dem Kamin nach einem Spaziergang am Strand. BR B Ausstattung: / B BR 2 Queensize-Betten, ein vollständiges Bett, 2 Badezimmer, Master mit Whirlpool, Gaskamin, voll ausgestattete Küche mit Geschirrspüler, Kaffeemaschine, Toaster, Mikrowelle, alle Utensilien, Bettwäsche inklusive, Waschmaschine / Trockner, Kabel Fernseher, WIFI. Aktivitäten: In der Nähe von Fahrradfahren, Einkaufsmöglichkeiten, Restaurants, Antiquitäten, Paddelbooten, Kajaks, Whale Watchs, Golf, Minigolf. When we planned our East Coast trip we decided we would need a few days’ rest after visiting Washington and New York before our final stop in Boston before returning to the UK. Sea Watch was absolutely perfect. We hired a car in New York and it was an easy drive to Cape Cod. The house is in a lovely quiet road with enough parking at the front for two cars. When we opened the front door and saw the ocean we knew we had made an excellent choice. It was so lovely to cook a meal that first night, open a bottle of local wine and relax watching the ocean. We particularly enjoyed looking at the beautiful night sky. There was plenty of space for our (grown up) family and the upstairs bedroom has a veranda running right across the back. Being able to walk straight onto the beach was wonderful and we loved the whole area. Nancy was very helpful throughout the booking process and always responded to our emails very quickly. I would thoroughly recommend staying at Sea Watch. Thank you Nancy for allowing us to share your beautiful ocean retreat. This was our first time staying at your lovely beach house. There is nothing quite like being right on the water. Your home had everything you would need very clean and cozy and had that Cape Cod feel. Your at a good location for shopping, restaurants and sight seeing not to mention having your own private beach. The owner is very nice and helpful she made our stay very pleasant. 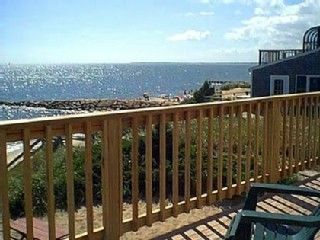 The Cape is a great place for a vacation and would stay here again and would recommend this property to friends and family. We can't wait to come back!! This was our first time staying at Sea Watch but it will not be our last!!! From the moment we walked in to the time we left, we kept saying what a beautiful view and what a great home. This house is so clean, cozy, we felt like we were at our home away from home. The bonus of the whole trip is that we were able to bring our dog and he got to enjoy the vacation as well. We stayed the first week of December and had great weather and the fireplace at night made it so warm and cozy!!! The upstairs master bedroom and bathroom has the feel of your own private spa, I loved sitting in the window seat and reading a good book. The owner Nancy, was wonderful to deal with and we look forward to staying here again, soon!!! Very nice. Great ocean views. This was our second time here. Loved the new fireplaces although we didn't need them as the weather was great! The house was very clean & the views from inside are spectacular! Hopefully, we'll be back next year. It's also centrally located, close to attractions and restaurants. We arrived on Sept.26 for a three night stay for a girls get away. What a perfect beach house! This house is clean, roomy (plenty of room for five women), nicely decorated, comfortable beds, in a great location and has spectacular views. This vacation rental lacked nothing. Sitting on the couch or eating at the dinning room table or outdoor table we were treated to the ocean. It does not get better than this! We also found the location great for getting to some nice stores for shopping. Our only regret was that time passed by too quickly. We are looking forward to our next opportunity to stay here. Arrived on April 5 to find exactly what we were hoping to find....an awesome place! Cozy, clean and comfortable. The place was perfect for our family weekend getaway. Well stocked kitchen, spacious bedrooms, comfortable living room for hanging out together. Owner was easy to contact and our deposit was returned within days of leaving the Sea Watch. Hoping that we have the opportunity again this year to get back..maybe in the fall. Thank you for having this rental available for us.